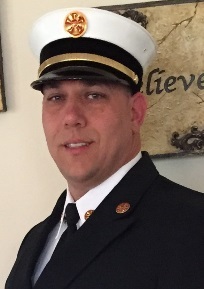 As the Fire Chief for Burns Harbor Fire Department, I want to take this opportunity to welcome you to our website and thank you for taking time to get to know us. ​As the Fire Chief, I am privileged to lead this fire service organization of such committed and skilled staff and members. The men and women of Burns Harbor Fire Department and their unselfishness pledge for their commitment to serve and protect the lives and properties of the citizens of our great community. ​On January 1, 2007 the Town Council appointed myself as Fire Chief to continue to lead this department forward as the retiring Fire Chief was doing at the time he decided to hang his helmet for retirement. ​Burns Harbor Fire Department prides ourselves in the rich history and traditions of the fire service, we also take pride in protecting the enriching history of our Town in which we are privileged to serve. ​Our Department values the trust, compassion, diversity, respect and commitment that the community has given this Fire Department. I am very proud to be a part of this 28-member team that upholds these values each and every day and every call for service. ​It is my hope that the information in this website is useful and highlights this great team of emergency responders. Please feel free to leave suggestions or comments to help us improve.